There’s no source of pleasure and pride than to have a well-cared for plant that has lived in a house for many years, flowering duly in its season. These plants are treated by their respective owners like well-polished antiques. These are flowering houseplants, as opposed to the flowering potted plants. Flowering potted plants come and go depending on the season. Flowering houseplants can get quite large and will eventually need a large space like a hall with a high ceiling or a patio door. Even a nice conservatory or sunroom suits the purpose. Choose your plants wisely in order for them to stand the test of time. Don’t be drawn into the beauty of a huge, light-craving, hot-climate houseplant if you live in a small, dark, cool cottage. And if your home gets the full glare of the midday sun, there’s little point in buying a plant that requires shade. You can pick from the most popular plants available or look for something different from a specialist grower. Make sure you purchase your plants from a reputable supplier. Watch for healthy-looking plants that aren’t pot bound. They should have plenty of new buds and exhibit a lot of growth. Your plant will need to be repotted when you get it home. You should put your plant in a pot one size larger than the one it came in. As its roots fill the pot, you can repot again, at the end of the dormant period. This might be every year, especially while the plant is young and growing a lot. Once the plant exhausts the minerals in the compost, you’ll need to fertilize and feed the plant, especially during the growing period. This happens about six to eight weeks after you repot it. Flowering potted plants are less permanent than your other flowering houseplants, but just as beautiful an addition to your indoor garden. The reason they are less popular is because while they are in their resting period awaiting another blooming period, they are somewhat less attractive than the flowering houseplants. A healthy potted plant makes a nice centerpiece for your dining room or windowsill. If you place a brightly colored flowering plant among some of your foliage plants and ferns, it will make the arrangement come to life. Go to your local garden center at any time of the year and see the choices of pot plants available. A lot of supermarkets have them as well. You can find all sorts of nice pot plants to help brighten your home, even if only for part of the year. Cyclamens and azaleas flower in winter or early spring. Spring primroses, celosias and pocketbook plants bloom in the summer. They are quite beautiful and colorful while they are flowering. Once they’re done flowering, most people throw them away or plant them outside. Some of them are annuals, so they only grow for one season anyway. Some are short-lived perennials that may have been trained or treated artificially in order to bloom at special times throughout the year. If you feed these plants generously and remove the dead and dying flowers just as you would outside, you might be able to keep these flowers growing and extend the flowering period. Most potted plants need good light, but make sure you check the care instructions carefully. You should protect these plants from changes in temperature and drafts in the wintertime. Remember, most of them don’t grow in the winter and if they are meant to flower in the winter, they usually require less heat than in the average living room. Another type of plant that is kind of a flowering plant is an insectivorous plant. It’s name says what it does: it eats insects. There are three main types of insectivorous plants. There’s the pitcher plant, the sticky-leaved plants (like sundew) and the fly traps. They are more interesting to add to your houseplant collection than they are pretty to look at. They are also not easy to keep. They require both a protected environment and high humidity. So, now you know that there are many different ways to brighten your indoor gardens and make them interesting. 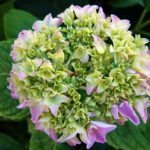 If you go with flowering pot plants, you’re getting more familiar garden variety flowers like the azaleas, begonias, and hydrangeas. All of these are beautiful, but don’t last long. 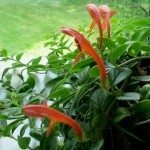 If you go with the flowering houseplants, you’re going to have a more tropical feel to your garden with things like the goldfish plant or even the passionflower. Either way you decide to go, you’ll have a beautiful, colorful indoor garden that will keep you happy for all seasons.